*Note: Faculty, Graduate Students, and Staff have extended loan on Books, Annuals, Maps and Map Tubes. *Note: Borrowing privileges are suspended when maximum fines or overdue items are reached. Library cards must be presented at each transaction. Any fines incurred are the responsibility of the borrower. A library card is to be used by the registered owner only and should never be loaned to others. The Library is not responsible for loaned, lost, or damaged cards. Lost or stolen TrentU Cards are to be reported to the University Security Office immediately. Lost or stolen library cards should be reported to the Library Service desk. Circulating Annuals, Books, Bound Serials, Curriculum and Pamphlets have a loan period of 2 weeks with 3 renewals. Maps (except atlases, travel maps, and maps held in the Maps Workroom) may be borrowed for a period of 7 days with 3 renewals. Circulating Media materials have a loan period of 1 night with no renewal. Current Periodicals have a loan period of 2 days with no renewal. Reserves material - consult the Regulations on Borrowing Reserves. Interlibrary Loan material - consult the Interlibrary Loan page. *Faculty, Staff, and Graduate Students may have an extended loan on Annuals, Books, or Maps at the time of checkout or renewal. Items on extended loan may be recalled after two weeks. There are no extended loans available on Bound Serials, Curriculum material, or Media. Extended loan due dates are January 15, May 15 and September 15 each year. Renewals may be done online by accessing the My Account feature within the library catalogue, or in person at the Library Service Desk with the item in hand. Renewed items are subject to recall. Recalled items or items on hold for another user may not be renewed. Interlibrary Loan renewal options should be reviewed prior to contacting Client Support for assistance with a renewal. Items on Extended loan may be renewed by Faculty, Staff, and Graduate Students one (1) month prior to the extended loan due date. Items on extended loan may be recalled after two weeks. All materials, including Reserves and Interlibrary Loan material, must be returned in the book return drop located at the Library Service Desk during Library hours. When the Library is closed, material may be returned in the External Book Drops available at the main entrance of the Bata Library and the Durham Branch. Material may not be passed back and forth between users; items must be returned and processed through the library system. A Hold may be placed online on a regular stack book which is signed out. Placing a Hold puts you in line to sign out the book next. It also prevents the book from being renewed by the current user. For help using the Hold feature within the library catalogue, see My Account. Holds may not be placed on Media, Reserve or Interlibrary Loan material. A user cannot place a hold on a book s/he already has signed out. A recall process is automatically begun when a user places a Hold on an item currently signed out on extended loan, or regular loan that has been renewed. Overdue fines on recalled items are $5.00 per day. All items are to be returned directly to the library by the due date. To avoid inconvenience, return material to either Bata Library or Durham Branch by the due date. Current Periodicals, Media and Interlibrary Loan material are assessed a daily fine of $5.00 per item, to a maximum of $75.00 per item. Recalled material is assessed a daily fine of $5.00 per item, to a maximum of $75.00 per item. Reserve fines - consult the Regulations on Borrowing Reserves. Items not returned within 90 days are assessed a Lost Item charge of $100.00 for all items excluding Map Tubes and ILL material. Map Tubes are assess a Lost Item charge of $20.00. For further information regarding lost or damaged Interlibrary Loan material consult the ILL Overdue Fine Policy. Fines may be paid in person via TrentU Card, debit, Visa, and Mastercard at either Bata Library Service Desk or Durham Branch during operating hours. Credit card transactions are also accepted via telephone during operating hours by calling 705-748-1011 x7423 or 905-435-5102. Fine appeals are regulated by the Library Fine Appeal Policy. A fee is charged to any material lost or significantly damaged. These fees cover replacement and processing costs. The Lost Item charge of $100.00 is applied for all items excluding Map Tubes and Interlibrary Loan material. Map Tubes are assess a Lost Item charge of $20.00. Lost and/or damaged Interlibrary Loan charges are assessed by the lending library. For further information consult the ILL Overdue Fine Policy. Borrowers who subsequently return items after they have been declared lost will be credited the Lost Item charge minus any outstanding overdue fines for the item. No credit is given 12 months after initial payment. Trent undergraduate students are suspended when they have three outstanding overdue items and/or fines of $25.00 or more. When fines exceed $25.00, undergraduate students will be unable to request transcripts, add or drop courses, or view grades through WebAdvisor until fines are paid. Once fines are paid through the Library, WebAdvisor restrictions are removed within 24 hours. Students who have successfully completed the academic requirements for their degree, but who are not free of financial obligations to the University, may participate in the convocation ceremony but should arrange to settle their debt prior to the ceremony. Trent graduate students are suspended when they have three outstanding overdue items and/or fines of $25.00 or more. Trent faculty, staff and retirees are suspended when they have three outstanding overdue items and/or fines of $10.00 or more. The library makes a reasonable attempt to send notices when items are overdue, considered lost (at 90 days overdue), recalled, and when requested items are available for pick-up or cancelled. A monthly statement is also sent to anyone owing fines. These notices are sent to the email address as listed in the user's Library account. 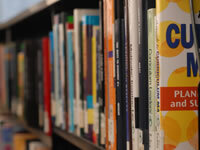 Users are responsible for keeping the Library updated about where notices should be sent. Failure to receive a notice does not excuse a fine.